Last of the Maureen O'Sullivan Tarzans has Jane and Tarzan going to the Big Apple after Boy who was taken to America by poachers (who thought Tarzan and Jane were killed in a fire). Boy is put to work in a circus and the happy couple run around trying to find their son. Brief adventure film is quite enjoyable on its own terms, though I don't know how its going to play if you haven't seen any of the previous five films since any notion of character is out the window. The film starts in the typical manner of the idyllic life being turned upside down by the arrival of a party-this time in a plane-which then results in the main plot being put into motion. Its not bad, just formulaic, as all but the first two films in the series have been. 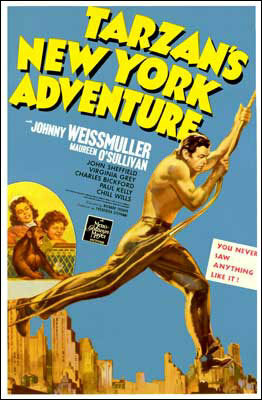 Worth a look if for no other reason to see Tarzan running amok in a modern city and leaping from the Brooklyn Bridge.